Includes: STMB001, STMB002, STMB003, STMB005, STMB006, STMB007, STMB008, STMB0010, STMB0011, STMB0012, STMB0013, STMB0015, STMB0016, STMB0017, STMB0018, STMB0019, STMB0022, STMB0023, STMB0024. For all information please check the links below. STMB001 Read All EIS/EZS Types VIA IR/OBD/CAN and K-LINE. STMB003 Read password from Motorola EIS/EZS VIA IR and ZIF Socket/With and without existing key. 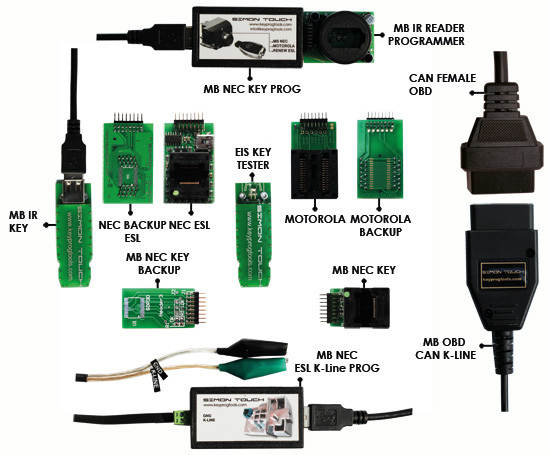 STMB005 EIS Reading /Writing of additional information by CAN/OBD/IR/ Personalize EIS by OBD. STMB006 SKC (Simon Key Calculator) Offline fast key calculation. STMB009 NEC keyless read/erase/write on adapter board. STMB010 Motorola all versions read/erase/write on adapter board. STMB011 Read password from BE key/China key/erase/write key dump Via IR. STMB012 Crey key functionality - read/ prepare/write Grey key for programming new EIS. STMB014 All key by IR Password read - All Key versions/Keyless/BGA. STMB015 Renew all ESL/ELV Types/used/blocks/not repairable/ Fast renew. STMB018 ESL Doctor/Change Vin/Milage from ESL/ELV By K-Line. STMB019 Program new ESL/ELV/EMULATOR/ Unlimited calculation/No tokens/No dealer pass. STMB020 7G Resetting ETC (722.9) by OBD/CAN to the factory state without loosing of SCN coding. STMB021 ISM Resetting by OBD/CAN to the factory state without loosing of SCN coding. STMB022 ECU Renew Engine control units online.